So, Hearts narrow the gap on Aberdeen in second place to six points following their comfortable victory at home to Inverness CT.
Kilmarnock boss Lee Clark is left ruing defensive lapses after defeat by Ross County sees the Ayrshire outfit continue to feel Dundee United breathing down their necks. In the Championship, Rangers extend their lead over Hibs to 14 points, with Falkirk now just a point behind Alan Stubbs' men. "We set out our team to attack tonight and we knew the importance of three points. It [Rugby Park] is a venue we've done well at. The boys enjoy playing on that and we certainly showed that." "Not good enough in both boxes really. We've given away two awful goals and we haven't worked their goalkeeper enough with the chances we created. "I'm really disappointed. We had started on the front foot and put a bit of pressure on them. We've then defended very poorly for that [Alex Schalk] goal. We didn't pick people up in the penalty area and had two or three defenders ball-watching. "And the second goal is so poor it's untrue. We're becoming over-reliant on [goalkeeper] Jamie MacDonald: that's a problem. We think he's going to get us out of those situations too often." "I'm baffled to be honest as to how we've lost the game. It's a sore one to take. We've completely controlled the game and we've had chances. "Unfortunately, we haven't taken them. They've had, I think, one shot at goal and they've scored from it. "We feel we deserve more than what we got tonight. We've had enough chances to get all three points. "Right now it just doesn't seem to be falling for us. "We've obviously made it more difficult to go up automatically [Hibs are now 14 points behind leaders Rangers] as champions. That's difficult now. "But we've said all along: our ambition is to go up and we still have a possibility of doing that and a good chance of doing that." "I'm disappointed with the goals we lost - especially the second. At 1-0 we were always in the game. The first goal is a 30-yard pass over the top and we need to see that coming and deal with it. "I'm really disappointed - we played some nice football and huffed and puffed. Hearts played with a better energy and got at us. "Fon Williams only had one or two saves; it was that kind of game. 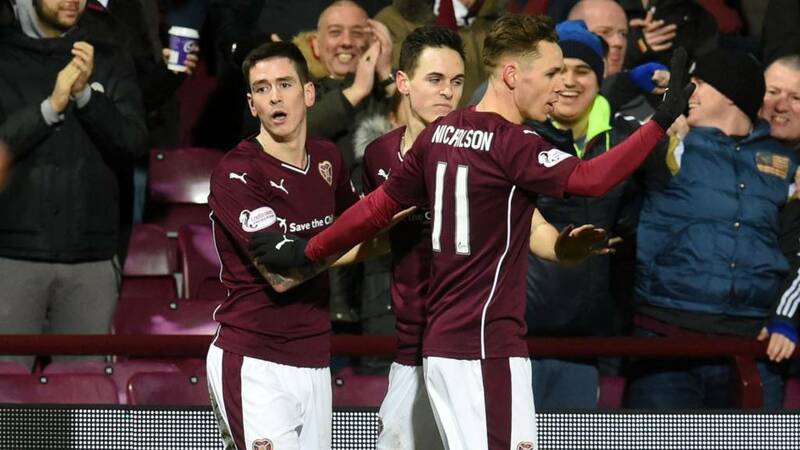 Possibly over the piece I think Hearts deserved to win it." "I'm pleased; it was a good performance against a very good team. I thought we passed the ball well and were very patient. We controlled a lot of the game. "Towards the end and the last 15 minutes I thought Inverness came into it when they changed their shape a bit. "But it's another three points and six out of six so far this week. We want to make it nine out of nine on Saturday [at home to Partick Thistle]." Robbie Neilson's men move to within six points of Aberdeen in second place - who face Dundee United tomorrow night - courtesy of a comfortable victory at home to Inverness CT. Goals from Harry Forrester and Lee Wallace secured victory for Rangers and, with Hibs losing at Queen of the South, saw the Ibrox outfit increase their lead at the top of the Championship to 14 points. Falkirk, who fought out a goalless draw with St Mirren, are now only a point behind the low-flying Hibees. Are you watching Mixu? Dundee United may have been thrown a lifeline as Ross County double their lead late, late, late on at Rugby Park. Brian Graham lobs Jamie MacDonald to seal the points for County, who move up to fourth in the table. The Dundee United boss would be forgiven a wee soft-shoe shuffle dance in his living room after hearing of County's second goal.